The most immediate announcement from AMD is two Ryzen 3 Mobile processors designed to fill out the Mobile stack, and the introduction of Ryzen-based APUs for desktop machines. At the heart of both of these designs is the combination of AMD’s first-generation Zen cores, specifically four cores in a ‘core complex’, connected to Vega-based graphics integrated into the silicon. The two units are connected via AMD’s Infinity Fabric, designed for high-bandwidth and scale, and a feature that permeates through AMD’s recent product portfolio. To date, AMD has already announced two products using this configuration. 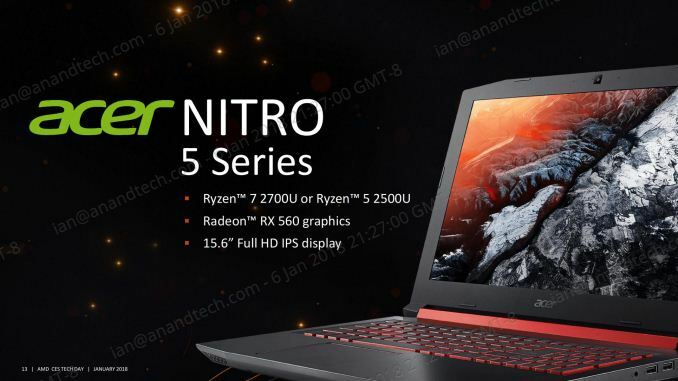 Both of them are for Ryzen Mobile, specifically the Ryzen 7 2700U and Ryzen 5 2500U, which have already been pre-announced in devices such as the HP Envy x2, the Lenovo Ideapad 720S, and the Acer Swift 3. Only the HP Envy x2 has been launched into the market so far (with mixed reviews due to the OEM design, which draws similar criticisms when equipped with Intel CPUs), with the others to see light in Q1 as well as other OEMs like Dell. The first announcement is regarding adding more Ryzen Mobile processors to the family to cater for a wider audience. To pair with the Ryzen 7 Mobile and Ryzen 5 Mobile, AMD has two Ryzen 3 Mobile parts which will formally be available on January 9th with expected system availability within Q1. The Ryzen 3 2300U is a quad-core processor without simultaneous multithreading, which separates it from the other components. The base frequency of 2.0 GHz, a top turbo of 3.4 GHz, and a total of six compute units in the Vega graphics (this equates to 384 streaming processors). The Ryzen 3 2300U shares the same TDP as the other parts, coming in at 15W, and AMD wants to position this as a high-performance part for eSports capable notebooks, handily beating anything from Intel’s 7th Generation family. The Ryzen 3 2200U is the only dual core component in AMD’s entire Ryzen product line, although it does have simultaneous multithreading to give it four threads in total. Having two fewer cores to fire up does give it a boost on the base frequency, coming in at 2.5 GHz, but the turbo frequency matches the other Ryzen 3 at 3.4 GHz. The 2200U is certainly the processor bringing up the rear, with only three compute units (192 streaming processors) in total, and helping AMD shift some of the processors that are not binned as aggressively as the higher-performance units. AMD is promoting these two processors as capable elements of an entry level 15W notebook that can process DirectX 12, offer advanced video features, and be used in aesthetically pleasing designs with a long battery life, including 2-in-1s, ultrathin notebooks, and gaming laptops. Not to be content with just announcing a couple of new Ryzen Mobile processors, AMD was eager to promote new mobile devices that will be using Ryzen Mobile. To accompany the HP Envy x360, the Lenovo Ideapad 720S, and the Acer Swift 3, Q1 will see the launch of a new HP (under embargo until later this week), the Acer Nitro 5 series, and the Dell Inspiron 5000 series. Acer’s Nitro line of laptops is typically aimed at the gaming crowd. The Nitro 5 dictates a 15.6-inch display, which in this case is a 1920x1080 IPS panel. Acer will use the pre-announced higher-end APUs, the Ryzen 7 2700U and Ryzen 5 2500U, but will also be pairing this with a Radeon RX 560 graphics chip. We were told by AMD that the integrated graphics and discrete graphics will be used in a switching context: for video playback, the lower power integrated graphics is used and the discrete is disabled, however the discrete graphics is fired up for gaming work. For compute, or for games that support multi-adaptor DirectX 12 technologies, both the integrated graphics and the discrete graphics should be available, however this is up to the game/software to implement. The Dell Inspiron lines are more home/small-medium business-oriented devices, and here Dell is also using the Ryzen 7 2700U and Ryzen 5 2500U processors to offer peak Mobile APU performance. 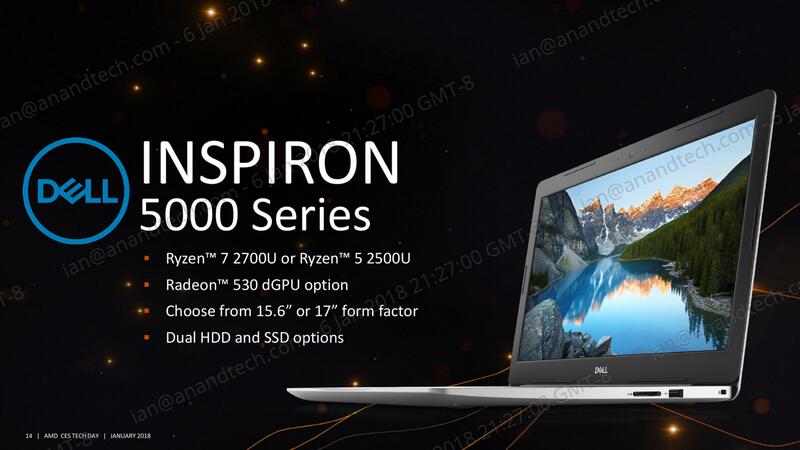 Designed more as a workhorse than for aesthetics, the Inspiron 5000 will offer AMD parts with 15.6-inch and 17-inch displays in a chassis that can support dual HDD/SSD options. The unit also comes with an optional Radeon 530 discrete GPU, which has 384 compute units based on AMD’s older GCN 1.0 architecture. This comes across as very odd, given that even the Ryzen 5 has 512 compute units of the newer Vega architecture. I can only assume that this provides extra displays for very specific customers, though for most it would seem an overly pointless addition.